While scouting potential investment opportunities, we get the opportunity to interact with many owners and operators. These are the people in the trenches, who see first-hand the strength of the economy, changing industry dynamics, and the effects of public policy. This past fall, we decided to survey owners and operators on the state of their businesses, the issues they’re facing, and how they’re adjusting to new realities. Is business really going as well as it seems on a macroeconomic scale? Do operators feel the “talent crisis” reported in the news? Is an economic downturn likely? What do owners really worry about? Modeled after the U.S. Consumer Sentiment Survey, we set up a page on our website with 20 simple questions that could be answered in 3 minutes or less by owners and operators of small to mid-sized businesses (targeting companies with under $100 million in revenue). The survey was intentionally anonymous, but we did request title, industry, location and revenue range to help add context to the data. Over the month of December, we collected 128 responses. Some findings validated our existing understandings. For instance, most owners and operators believe that the economy is strong, and their specific industry and company are reaping rewards from that. As operators, they are generally optimistic about the future. Many are also experiencing talent-related issues. Some results were unexpected. The sentiment on tax reform is more neutral. While optimistic about the future, most owners and operators believe a recession is likely within the next 3 years. The qualitative responses about their biggest concerns were illustrative of the variety of issues companies face. Over 20 industries are represented among the participants, with the largest shares coming from Business Services and Manufacturing. As such, we wanted to share some of the trends within responses from these specific sectors. Among manufacturing owners, there seem to be two groups. For one group, business is better today than prior to the Great Recession. The other group is neutral on the issue, which would suggest that they still feel some of the lasting effects of the downturn. Most manufacturers believe a recession is likely within the next 3 years, implying that, thriving or not, no one has forgotten the latter half of the 2000s. Competitive threats are manufacturers’ greatest concern, with many citing foreign competition specifically. Most Business Services companies are not experiencing the talent crunch evident in other sectors. No one reported hiring more people than anticipated. Most owners and operators in the sector were neutral on or disagreed with the idea that they had to significantly raise salaries last year, or that qualified labor is scarce. The exception were larger firms with revenue over $75 million. 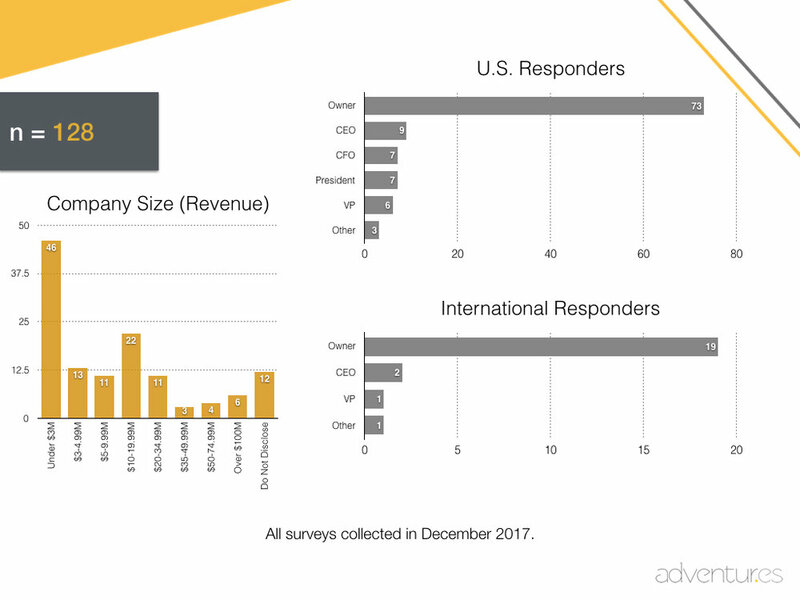 Another contrast and comparison opportunity was to measure the responses of those that represent smaller organizations (between $3 million and $10 million in revenue) from those that have achieved a higher level of scale (over $50 million in revenue). Larger companies are universally investing in the future, with most responding "Strongly Agree." Outside of the Entertainment industry, they disagreed with the idea that costs are increasing and gross margins are decreasing. Most believe the economy is strong, but are concerned about competition and regulatory changes. Smaller firms expressed more short-term concerns. 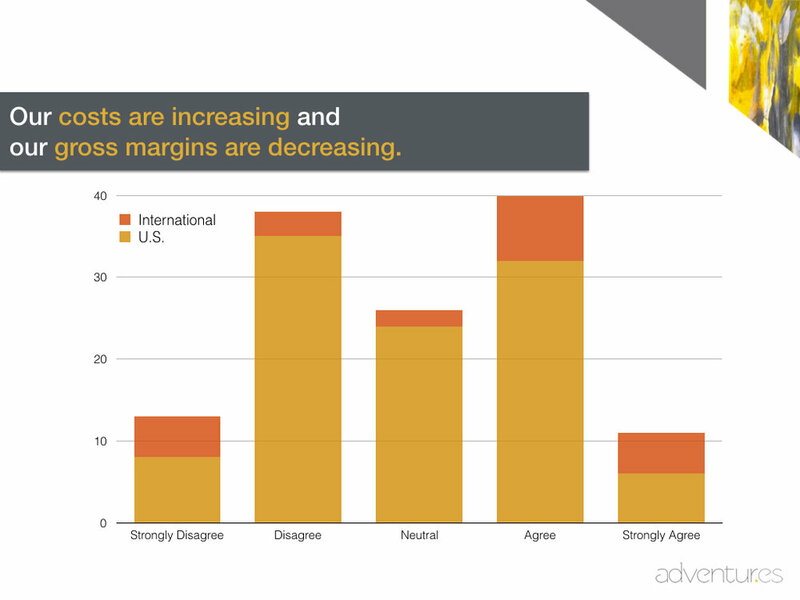 They are more likely to be experiencing margin contraction. Hiring and retaining talent was the most cited concern. Talent issues were evident in the multiple choice responses as well, with many saying wages are significantly increasing and qualified talent is hard to find. These owners and operators are also more likely to question whether and how to integrate technology into their operations. Unsurprisingly, the most insightful and thought-provoking responses were the open-ended responses about worries. We included most of the responses verbatim in the slide deck, only consolidating those with exactly the same meaning. Some concerns were macro, while others were micro, but all represent the challenges on operators’ minds.